When you think of the perfect backyard retreat do you picture a water fountain, flawless landscaping, and brickwork that makes the dream work? It sounds dreamy, doesn’t it? But it also sounds expensive, unattainable and unmanageable! Being relator’s, we have seen A LOT of backyards and here’s the thing, you don’t need a water fountain or flawless landscaping and brickwork to make your backyard dreamy. 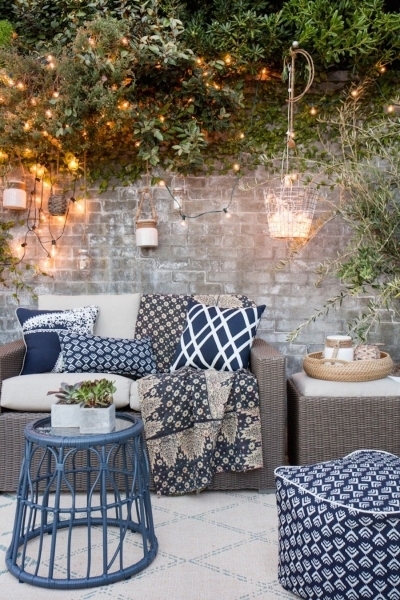 Instead, the essentials of almost every backyard hangout spot are all you need to truly have a place you can retreat to in peace. Below we break down the simple checklist to help you create the perfect backyard retreat just in time for summer. The whole point in having a backyard retreat is to RELAX! Therefore, we believe that comfortable seating is at the top of the list for this feat. The best thing about picking out furniture for your deck or backyard is that there is so much variety and countless different styles to choose from. Our favourite pairing is a loveseat accompanied by two single chair pieces. Depending on how many people you are planning for, you will have to add or take away some pieces. If you’re looking for something more modern, go with wicker chairs. If you’re okay with spending less, foldable stained wooden chairs still add a nice touch. We also love a statement piece of furniture – whether that’s a ‘pouf’ or a colourful bench seat – as long as you make sure it’s comfortable, anyone will utilize your pieces! This is where personality is incorporated! Décor is an even more versatile feat over choosing seating because you can choose different colours, shapes, sizes, and patterns! There are so many options when it comes to pillows, blankets, rugs, and fixtures, too. Depending on the overall theme or ‘feel’ you are hoping to attain, your décor will likely revolve around that. Right now we are loving spaces that incorporate a pop of colour from their pillows, throws, or rugs. Even if you don’t want to add too much colour, having mostly neutral colours with one statement piece is a nice touch and effortlessly incorporates the summer vibe. When you visualize a backyard retreat, often you are imagining it during a hot summer day as the sun beams down on you. However, we think that having a nice place to retreat to in the evening as the sun sets low and the crickets come out is equally as mesmerizing. Therefore, lighting is a must! Maybe you want to curl up on your loveseat and read a book, or maybe have a few casual drinks in the evening with friends. Either way, we’ve got you covered on the perfect lighting solutions for your backyard retreat! String lights add a nice ambiance to any setting as they hang along the deck railing or overhead roof. Marquee signs also add a nice touch of light that can stand alongside or on top of furniture while being trendy and personal to your liking. And of course, we cannot forget to mention lanterns that can stand on their own or hang up above as a vital lighting staple. If you want to take your outdoor space to the next level, we recommend adding some of these aspects into the mix! A bar, fire pit or patio heater, a grilling station, a garden, sheds and outdoor storage, and lastly, lawn games! What do you consider a staple piece for the perfect backyard retreat? Let us know by commenting below!